Spring is here, the daffodils are out and long sunny afternoons and evenings are upon us. This means one thing: outdoor cooking! Don’t get us wrong: we love brewing up a warming hot chocolate on our Frontier during the winter months, hands wrapped round a hot mug while we crowd round the stove for warmth… But after a wet and windy winter there’s nothing better than long, lazy evenings spent in the garden or away in the woods somewhere, enjoying the sunshine while you cook up a storm on your stove. It’s still chilly enough that gathering around a stove is delicious and cosy, but it’s much more likely that you’ll be enjoying a nice bit of sun and a fresh spring wind while you do. 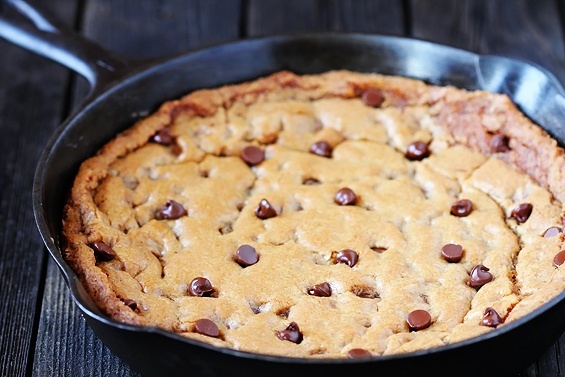 Here’s a fun recipe for a gooey, gorgeous chocolate chip cookie that you can cook in a skillet right on top of your Frontier, Traveller or Horizon. We got this idea from our great new retailer Lumberjack Outdoor, who are based in the Netherlands. Thanks, guys! As always we’ve given our measurements in cups to make camp cooking easier. Light your stove and give it half an hour to come up to temperature. You don’t want a fierce burn for cooking something like this, or else your cookie will burn on the bottom, so use bigger logs and don’t load your stove up too much with fuel. In a big bowl, cream the butter, sugar, egg and vanilla extract. Mix ingredients together and stir into the butter mixture. Pile into a 10-inch skillet and smooth off the top. Cover with a lid. Place on the stove-top towards the back, or on the warming plates if you’re cooking on a Traveller – you want them to cook slowly so they don’t burn on the bottom. Cooking time will vary depending on what kind of heat you’re using, but it should take around 15 minutes. Check for doneness after 10 minutes and pop back on the heat if you think it needs longer. There should be some gooeyness in the middle with a crispy crust round the outside. You can serve this as is, pile whipped cream or ice cream on top, or drizzle with honey, Nutella or your favourite sauce. The possibilities are endless: enjoy! If you give in to temptation and give this a go, let us know how you get on! Get in touch on Facebook, Twitter or Google+.